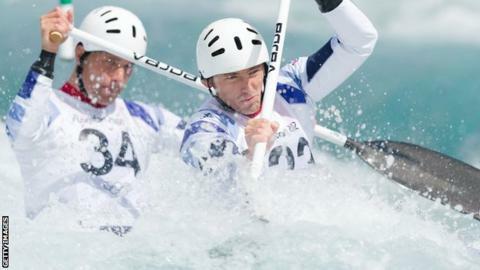 World champions David Florence and Richard Hounslow won a bronze medal for Great Britain on the final day of the Canoe World Cup final in Augsburg. The pair finished third in the men's C2, 0.89 seconds behind French winners Gauthier Klauss and Matthieu Peche. After a clean run, Florence, 32, said: "It was great to get on the podium." Later on, Britain's Fiona Pennie, Beth Latham and Mallory Franklin won silver in the K1 Team final, raising GB's medal count for the weekend to five. Florence, said: "The whole racing was very tight and the bronze medal was probably what we deserved." German pair Franz Anton and Jan Benzien took the silver. On Saturday, Franklin claimed gold in the women's C1, beating Australia's Rosalyn Lawrence by six seconds, as GB won three medals. Florence took silver in the men's C1, finishing 0.82 seconds behind Frenchman Denis Gargaud Chanut. Joe Clarke, 21, won a silver for GB in the men's K1 behind Germany's Sebastian Schubert. The British team will now prepare for the Canoe World Championship in Maryland, USA, which begins on 17 September. Florence, who will defend both his C2 title with Hounslow as well as his individual C1 crown, said: "It's very good to get a medal going into the Worlds."